I have a confessions to make….I am a hoarder….of cookbooks. Much to my husband’s dismay I have a rather large collection of cookbooks that only seems to be expanding. It doesn’t help that up until very recently, my sister worked at a major New York publishing house and would send me a box of free cookbooks a few times a year. In an effort to curb the expansion of my cookbook collection, I have re-discovered my love of the library. When I was a kid, summer vacation = library bliss. I would basically check out and read as many books as possible from the library. Long, hot summer afternoons were spent lounging on my bed, good book in hand, with breaks to get a bowl of ice cream. Big surprise that I ended up majoring in English Literature. Now that I have kids of my home, we make regular trips to the library as well. But I only recently realized what a treasure trove it is for cookbooks. It is especially a great way to try out a cookbook you may have heard about but don’t want to invest in until you figure out how much you will use it. On one of my most recent trips to the library I unearthed the book Indian Home Cooking by Suvir Saran and Stephanie Lyness. I have been a fan of Saran for many years thanks to the articles written about him and featuring his recipes in Food and Wine. So I was curious to check out his cookbook. I’m still on a kick to amp up my repertoire of easy everyday vegetable dishes so immediately started looking there. I wanted to find a way to make green beans Indian style that was different from my mother’s method of cooking them to death with potatoes – a version I was never overly fond of. Saran did not disappoint and had this quick and easy green bean dish that tastes more complicated than it’s short list of spices would suggest. Smoky from cumin with a bit of bite from ginger, this dish elevates the humble bean to something more complicated. If you can get your hands on it, please include ajwain or carom seed. It has a sharp thyme taste that is bracingly refreshing. 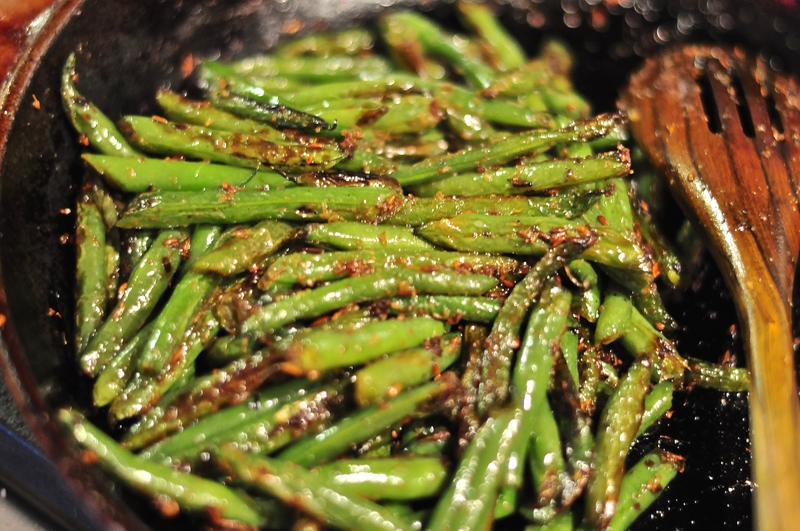 If green beans generally grace your holiday table, I would suggest giving this version a try to mix things up. And speaking of holidays, my next post will detail all my cookbook picks for the foodie on your gift list. I’m getting hungry just thinking about it…. Bring a saucepan of water to a boil. Add the beans, return the water to a boil and cook for 2 minutes. Drain the beans and rinse under cold water to stop the cooking. Combine oil, cumin, carom (if using), and asofoetida (if using) in a medium frying pan over medium heat. Cook, stirring for one minute. Add the ginger and cook, stirring for one minute. Add the beans and stir to coat with oil and spices. Sprinkle with salt and stir. Cover and turn heat down to low. Cook, stirring 3-4 times until beans are tender - 10-15 minutes. Add the lemon and lime juice and sprinkle with cayenne if using. Taste for salt and serve immediately.